Italian late Baroque sculptor. Born, Rome 1700. Died, Rome 1773. Among his most prominent works are the colossal Oceanus (or Neptune) of the Trevi Fountain and the sculptures of four funerary monuments in Rome: the tomb of Pope Benedict XIII in the Basilica of Santa Maria sopra Minerva, the tomb of Pope Benedict XIV in the Basilica of Saint Peter, the tomb of Maria Clementina Sobieski, wife of ‘The Old Pretender’ James Francis Edward Stuart, also in the Vatican, and the tomb of Cardinal Giuseppe Renato Imperiali in the Basilica of Sant’Agostino. He is also renowned for a group of busts and a significant number of drawings which are now dispersed among numerous museums and collections around the world, including the Canadian Centre for Architecture and the Musée des Beaux-Arts, both in Montreal, and the Ashmolean Museum in Oxford. According to historical inventories, he was also author of several manuscripts, most of them now lost, on a variety of subjects, including architecture, military engineering and sundials. Purchased by Monsignor Antonio Bonclerici (1801-1843) from Bracci’s heirs in Rome. After Bonclerici’s death, bought by the Aquari brothers (mid to second half of 19th century) in Rome. Later in the possession of Sir Alan H. Gardiner, who subsequently presented it to the former Ashmolean Museum Library (now Sackler Library). Thence transferred to the department of Egyptian Antiquities, Ashmolean Museum. Received at the Griffith Institute from Mr Liam McNamara, Keeper of Egyptian Antiquities, Ashmolean Museum, 9th December 2011. Oficially transferred to the Griffith Institute by Dr Graham Piddock, Sackler Librarian, 12th June 2012. Preliminary note on the Griffith Institute website: I Geroglifici ed Obelischi Eggizzi, 'opera postuma inedita di Pietro Bracci', 1767 (http://www.griffith.ox.ac.uk/bracci-special/). For a first analysis of the manuscript, see Bencini, Gaia 2018. 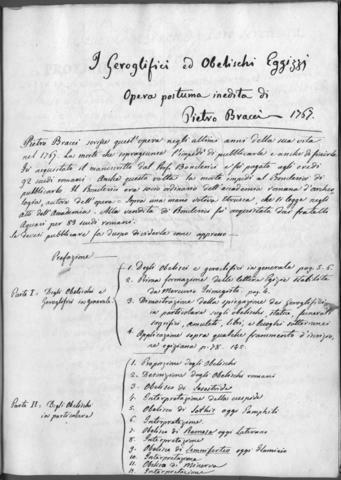 The fascination for ancient Egypt and the interpretation of hieroglyphs in 18th century Rome: Pietro Bracci’s unpublished manuscript ‘I Geroglifici ed Obelischi Eggizzi’ (MPhil thesis, University of Oxford) (http://www.griffith.ox.ac.uk/gri/Gaia_Bencini_MPhil_thesis.pdf).